Disney's biggest promotion of the year was released this morning - free dining! 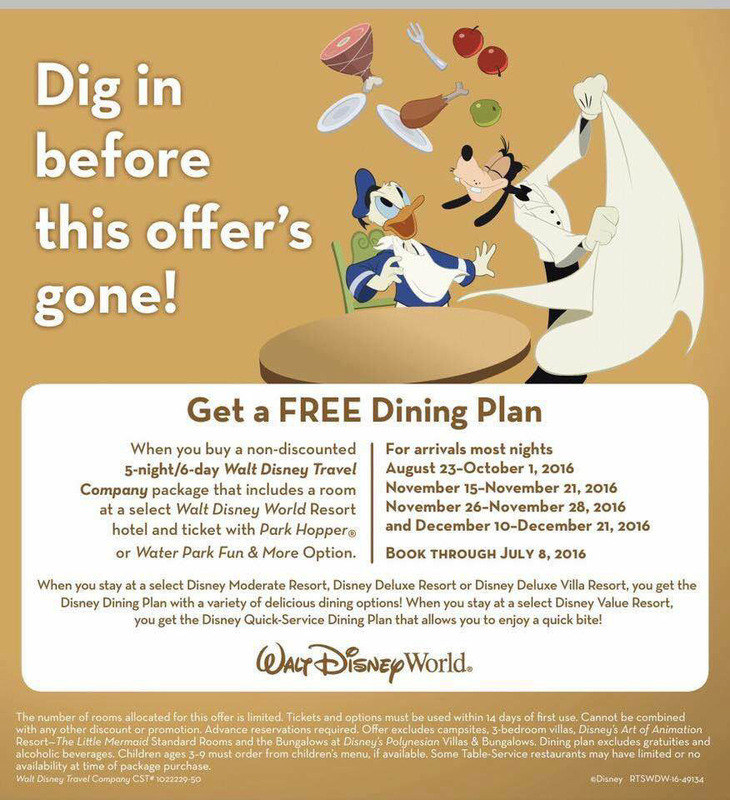 The offer is extremely limited, so be sure to email me today at disneykatrina@gmail.com to check on availability for your dates. If you already have reservations for these dates, I have already converted your reservation to the current offer so check your email to find your savings! Disney cruise line announced today that they are building two new ships. These ships will launch in 2021 and 2023 - with names and itineraries to be announced. So exciting!! I have just recently read that Disney only releases 9 fast passes per hour so that guests may meet with Anna and Elsa. It's no wonder that families find all the fast passes booked to meet the Frozen sisters - even when logging into their My Disney Experience page at 60 days from check in! 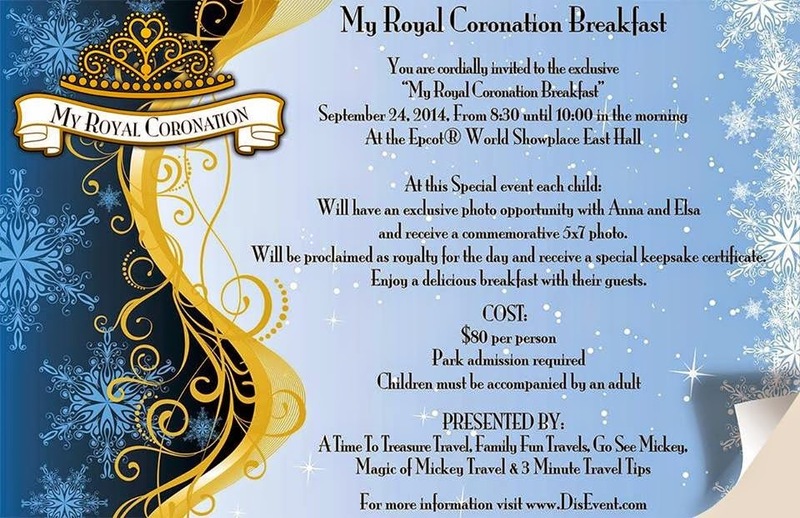 Well, my agency (and a few partners) is hosting a My Royal Coronation breakfast - where you can bypass the lines - and eat a delicious breakfast - and have a special moment with Anna and Elsa! This exclusive event will be on Wednesday September 24 from 8:30 am - 10am at Epcot. We still have a few tickets available! Message me today for more details! In thanks for your service, Disney has released military rates for accommodations at Disney resorts through October 3, 2015. These rates are good for both retired and active military personnel. Military members can purchase discounted tickets through their military base. 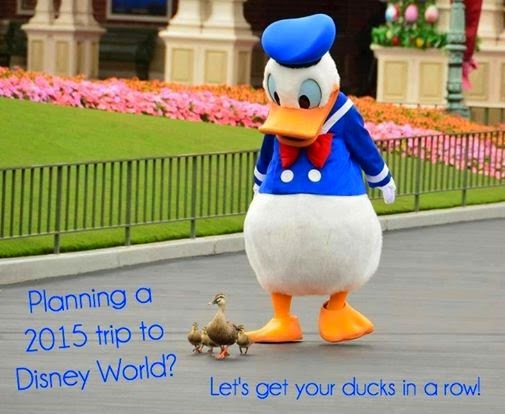 Email me today at disneykatrina@gmail.com to get a quote for your dates! 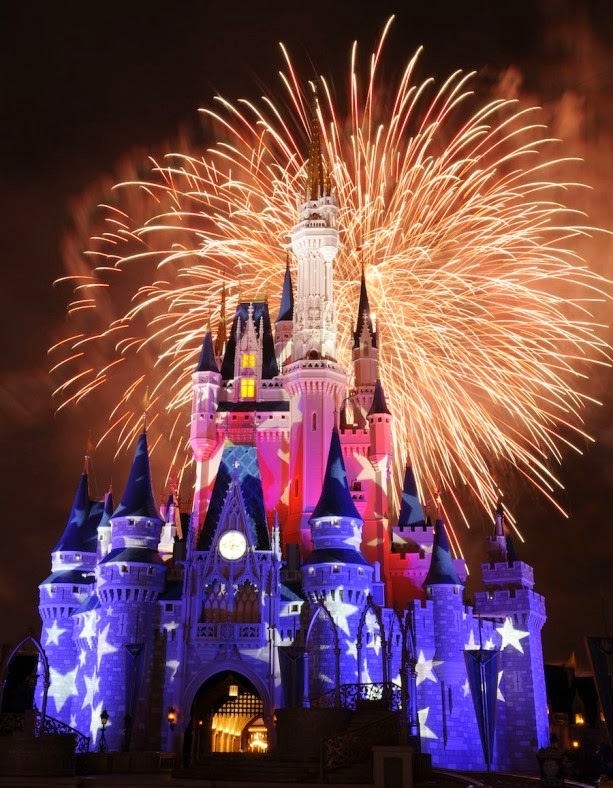 Disney World is a fun and magical place for kids… but it can be just as fun and magical for adults! 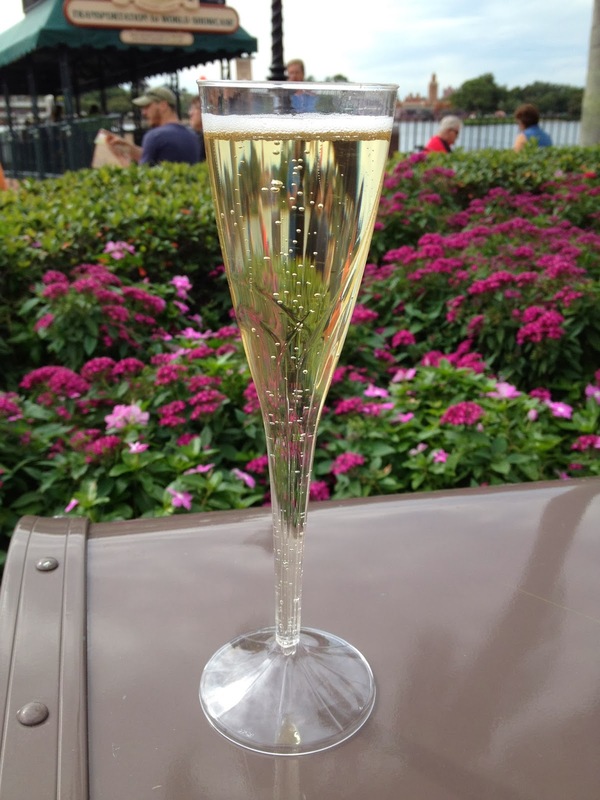 One of the perks to being a grown-up at Disney World is the chance to have some of the many alcoholic beverages Disney World has to offer. On a recent trip with several adult family members, I was able to enjoy a few of these beverages (and with the help of said family members; I didn't drink all of these on my own!) 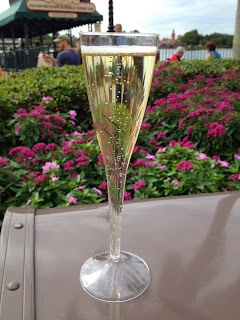 This particular trip took place while the Food & Wine Festival was going on at Epcot, so we were able to try some of the drinks from "around the World"! 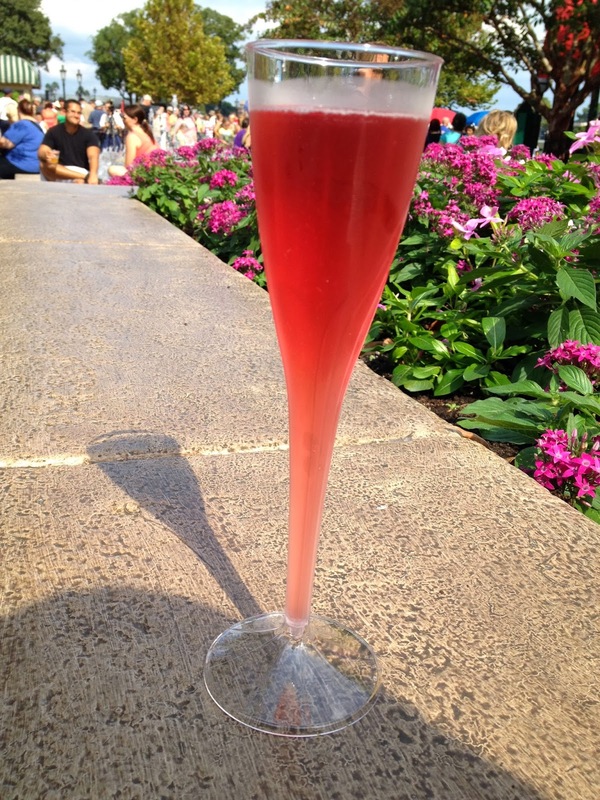 First up is the Kir from France, which is a sparkling white wine with pomegranate liqueur. It was crisp and refreshing, and a hit with many members of our party. We also sampled the Prosecco from Italy and one of the beer flights from Germany. The sparkling white wine from Italy wasn't as sweet as I prefer, but still very good. My brother-in-law is the one who ordered the beer flight and I forgot to take a picture (so photo credit on that one goes to the Disney Food Blog! 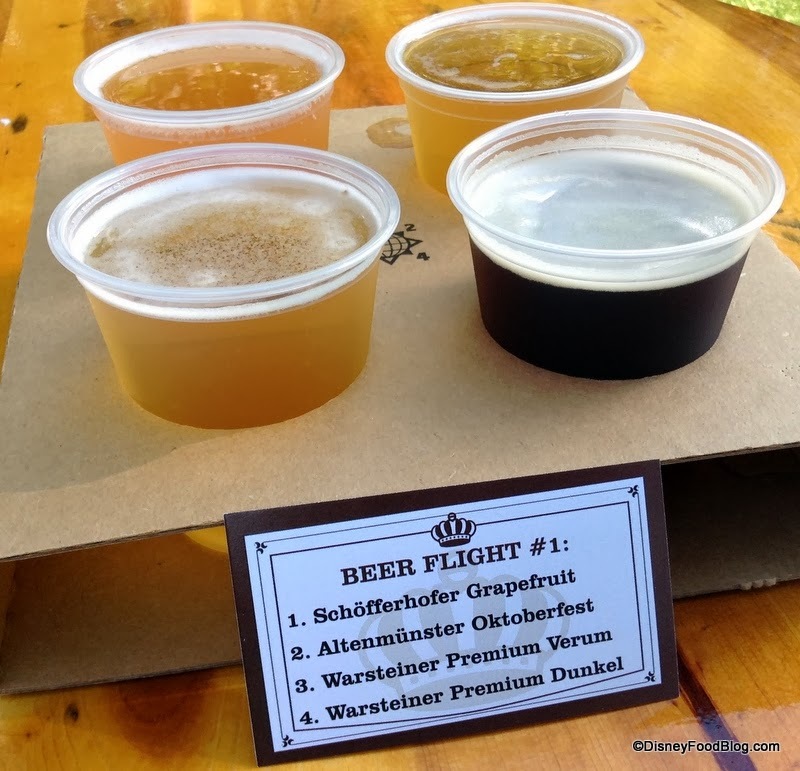 ), but the beers we sampled were: Schofferhofer Grapefruit, Altenmunster Oktoberfest, Warsteiner Premium Verum, and Warsteiner Premium Dunkel. I don't know much about beer, but I do know I prefer a pale ale over darker ones. Not many members of our party liked the Dunkel (in fact, I think it was only the guys who did!) but the Grapefruit and Oktoberfest were enjoyed by all. 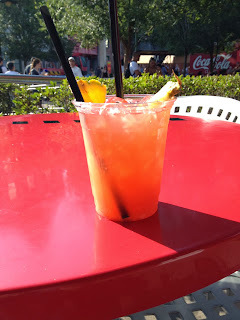 At Hollywood Studios, we headed over to High Octane Refreshments where I had the Banana Cabana. This yummy concoction is made with Cruzan Mango Rum, Parrot Bay Coconut Rum, Bols Creme de Banana, Pineapple Juice, and Grenadine. And it was easily my favorite beverage of the trip! Another drink sampled while at Hollywood Studios was the Magical Star Cocktail. This is actually one of Disney World's signature cocktails and is available at most table-service restaurants, and I had mine at Sci-Fi Dine-In Theater. 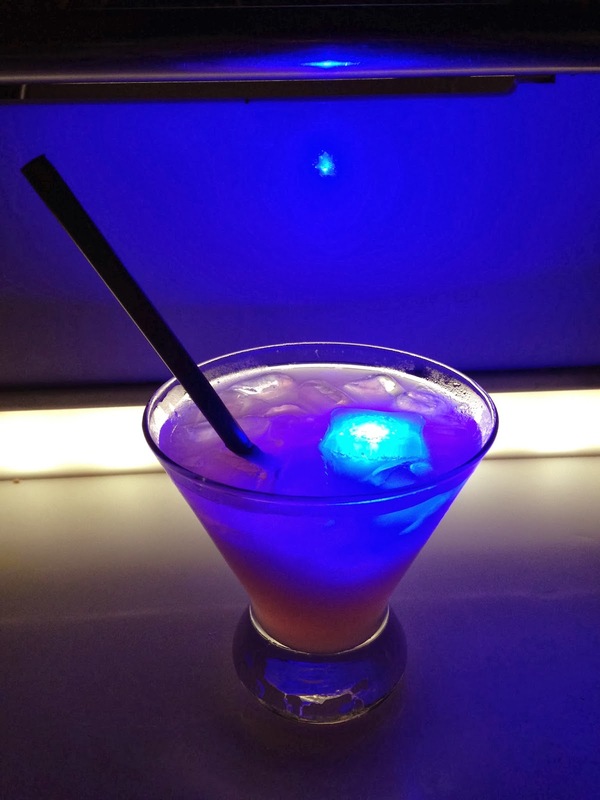 The Magical Star Cocktail is also a rum-based beverage, with pineapple juice and passion fruit liqueur… but what's fun about this one is that it includes a souvenir glow cube that changes color! 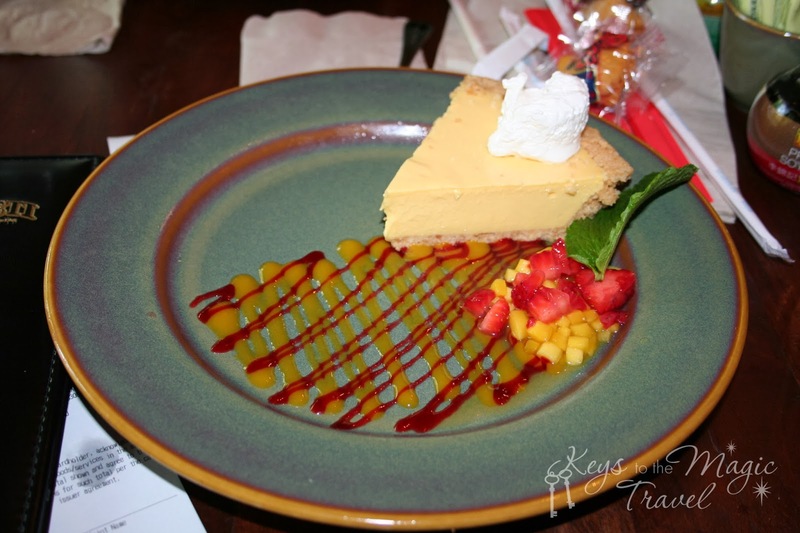 Outside of the parks, many of the Disney Resorts have at least one table-service (sit-down) restaurant. 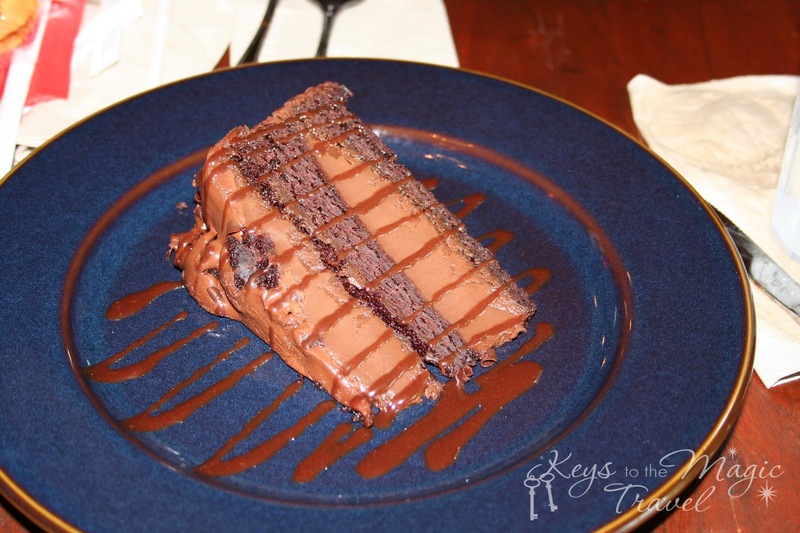 One of these at Disney's Animal Kingdom Lodge is Boma, a favorite dining place of my family's. It was there that I tried the South African Wine Flights. Featured Raats Unwooded Chenin Blanc, Beyond Sauvignon Blanc, and the Ken Forrester Petit Chenin Blanc. You may have noticed that crisp, fruity, white wines are a favorite of mine, and these did not disappoint! Another beverage from a Disney Resort restaurant is the Lapu Lapu. 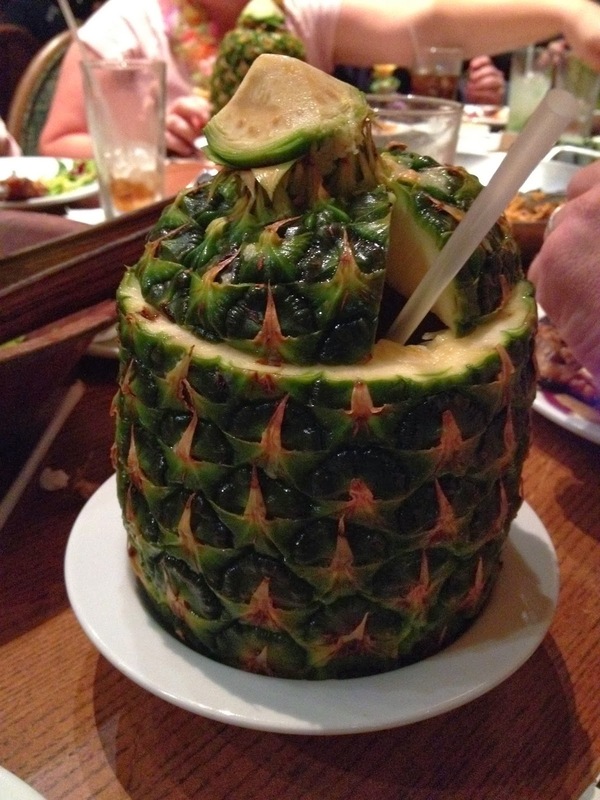 This one can be found at the Disney's Polynesian Resort. This is another rum-based beverage but what makes it super fun is that the Lapu Lapu is served in a hollowed-out pineapple! So there you have it: a few of the many unique drink selections you can find at Disney World. Which one would you like to try? 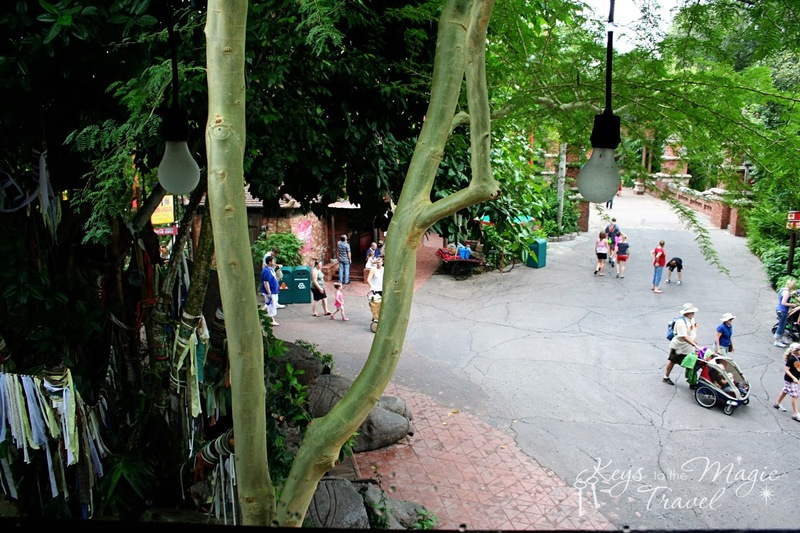 At Disney, the imagineering department makes sure that a ride is never just a ride; that a resort room is never just a resort room; or that a restaurant is never just a restaurant. 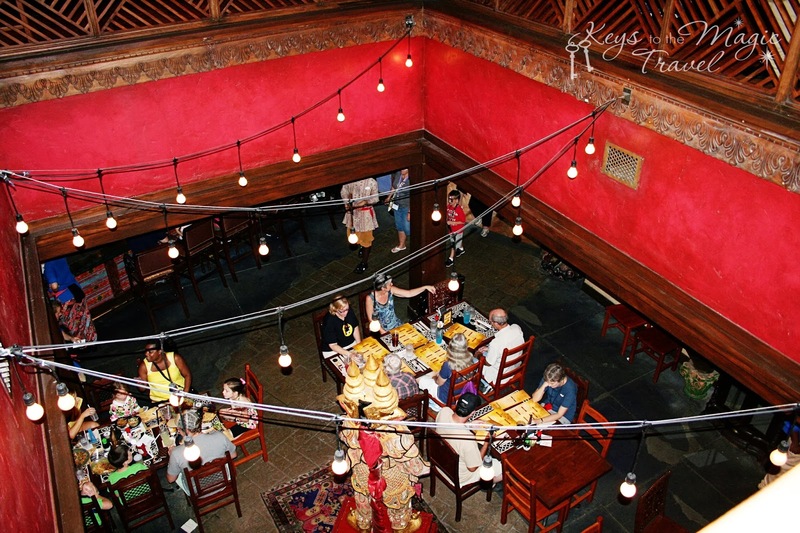 Animal Kingdom's Yak and Yeti restaurant is truly not your average table service location. It has a story. As you enter, you are transported to Anandapur in the foothills of the Himalayan Mountains - and the home of Arjun, a wealthy merchant who has fallen on hard times. 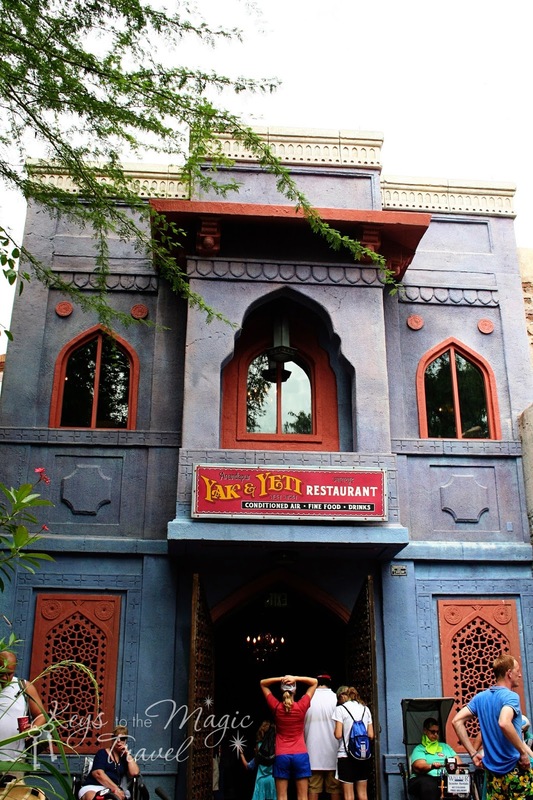 Arjun has turned his lavish home into a hotel and restaurant - Yak and Yeti. 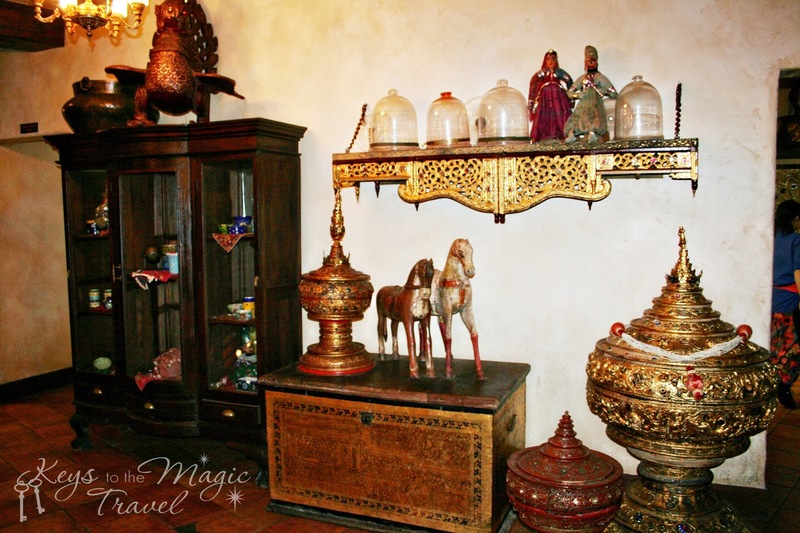 All the decor and artifacts throughout the hotel were collected by Arjun in his travels throughout Southeast Asia. For this visit we had lunch reservations. I like to arrive early so that I can really have a chance to look at all artifacts that Arjun has collected. 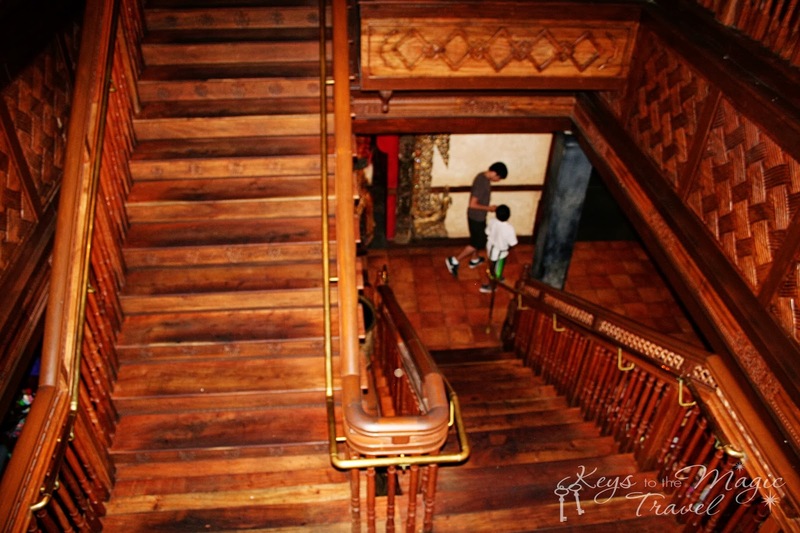 The restaurant has a really cozy feel with a series of rooms both on the main level and up the stairs (there is an elevator for those who need it). We like to sit upstairs by the windows - we have a great view and it's fun to people watch. If you'd like, you could even schedule an early dinner here and have a fabulous (and air conditioned!) seat to watch the Jammin' Jungle parade. Food wise, the general flavors of Yak and Yeti are pan Asian. First - I ordered a Yeti Blast. 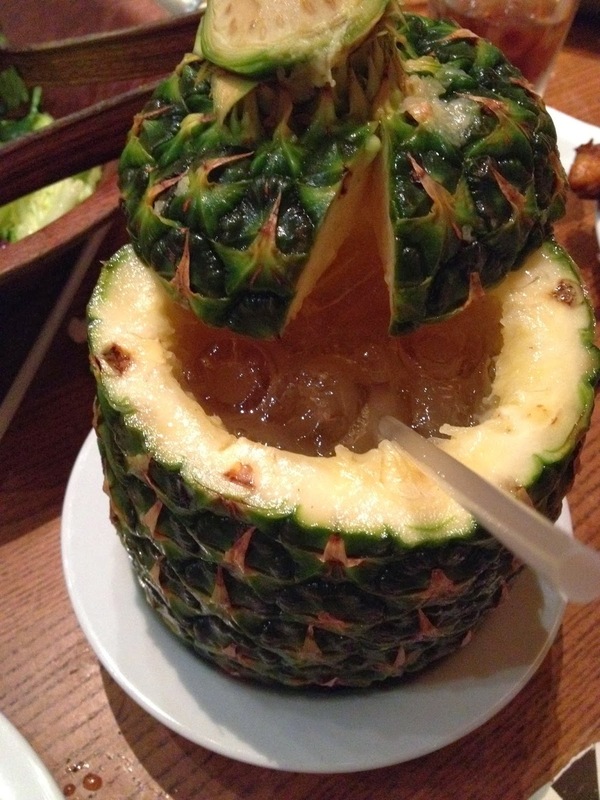 There is an alcoholic and non-alcoholic version. 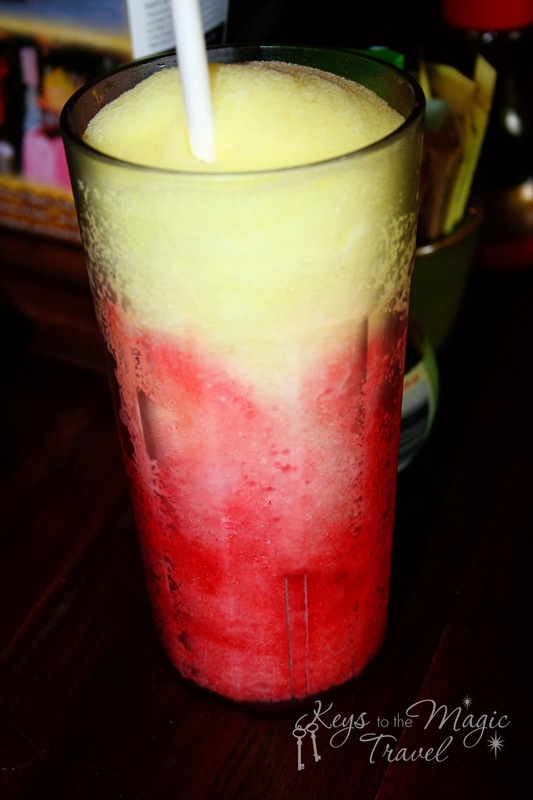 It's like a giant slushie with lime, mango, and strawberry flavors. We decided to have appetizers - trying the pot stickers and the wok fried green beans. Oh.My.Word. The green beans come with this sweet Thai chili dipping sauce - so so good. 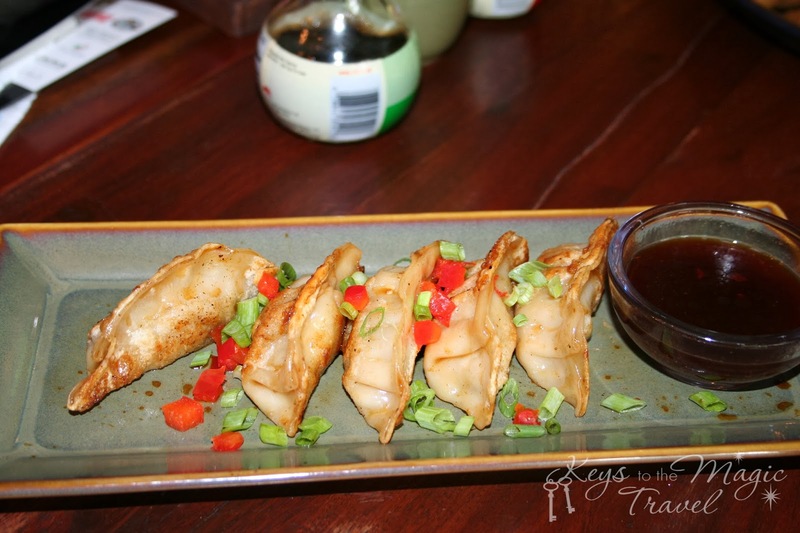 I am always a sucker for pot stickers and wontons - so these are a must do every time for my family. And now. 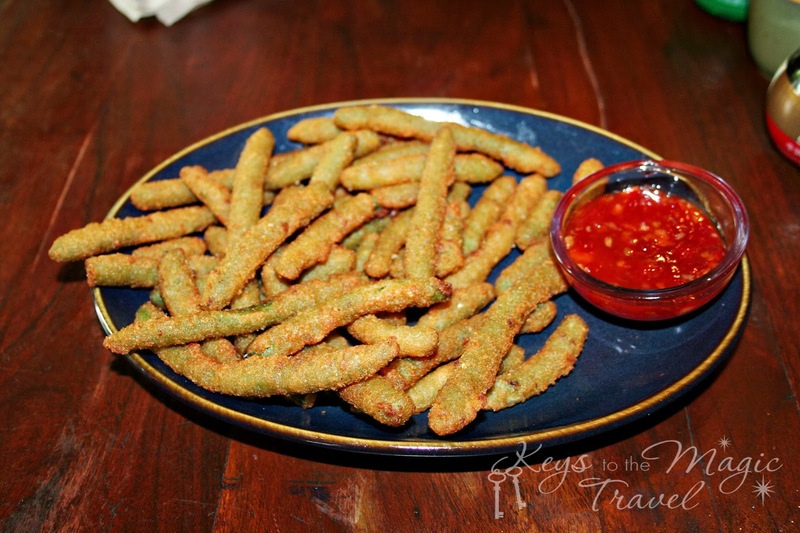 The wok fried green beans are a must do! 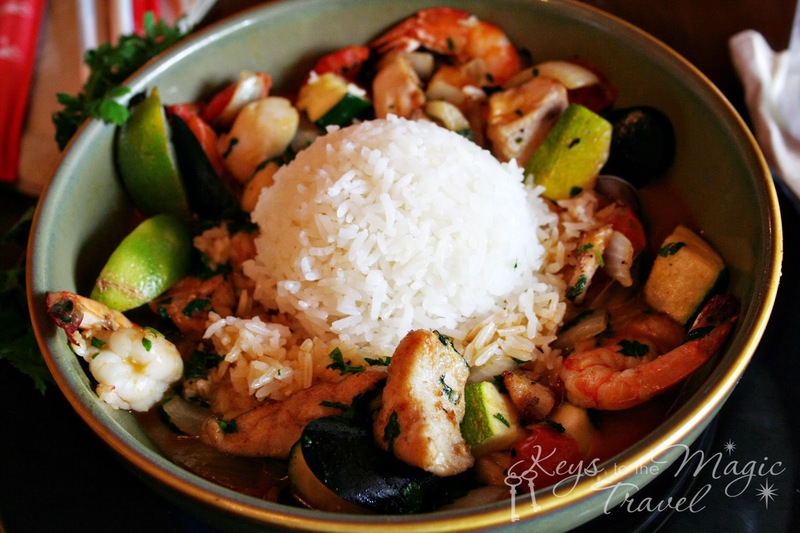 For entrees we had the Malaysian seafood curry (which they can make extra spicy for you if you want!) 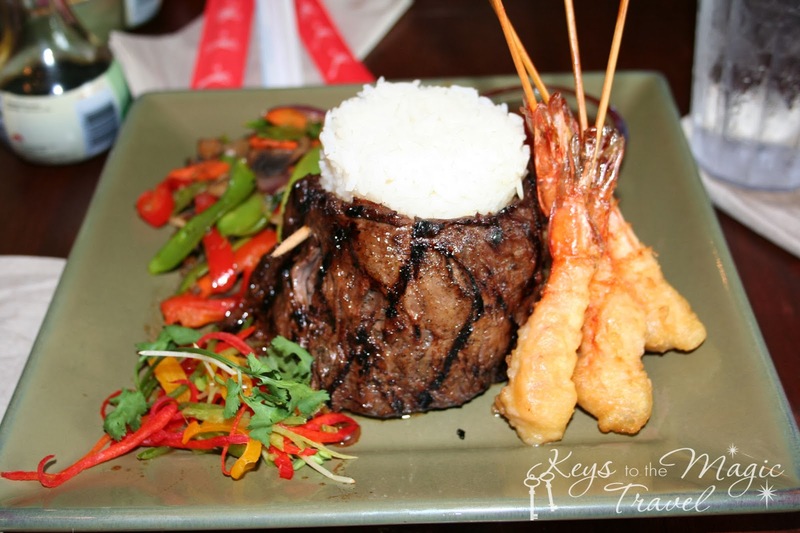 and the Shaoxing steak and shrimp. And then for dessert there was mango pie and chocolate cake with raspberry sauce. Now, I am a firm believer that fruit does not equal dessert. And that chocolate should not mix with fruit. So, when I asked them to substitute the raspberry sauce for chocolate sauce it was no problem - and our waitress said that it's actually a pretty common request. Yak and Yeti is one of our favorite tables services at Disney. The themeing, the decor, and especially the food make this a stand out! So...how about you? 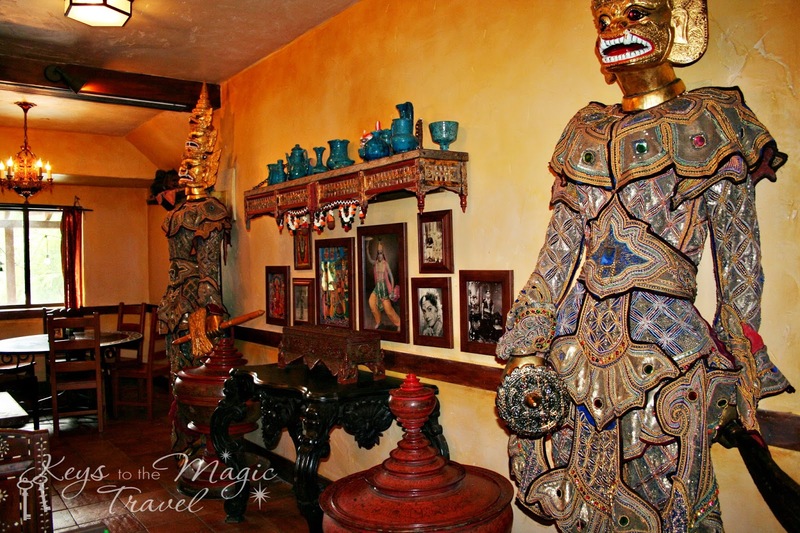 Have you had a meal at Yak and Yeti? After January 5th, the Magic Kingdom's daytime parade will be retired. A new daytime parade - the Festival of Fantasy will debut in the Spring. Hollywood Studios' Pixar parade went dark a few months ago and I am hearing that Animal Kingdom's fabulous parade will be retired next year. The Very Merry Christmas party started on Friday November 8th - and if you are character hunting, here is a great article that tells you about all the special characters - and even has a map telling you where to find them! 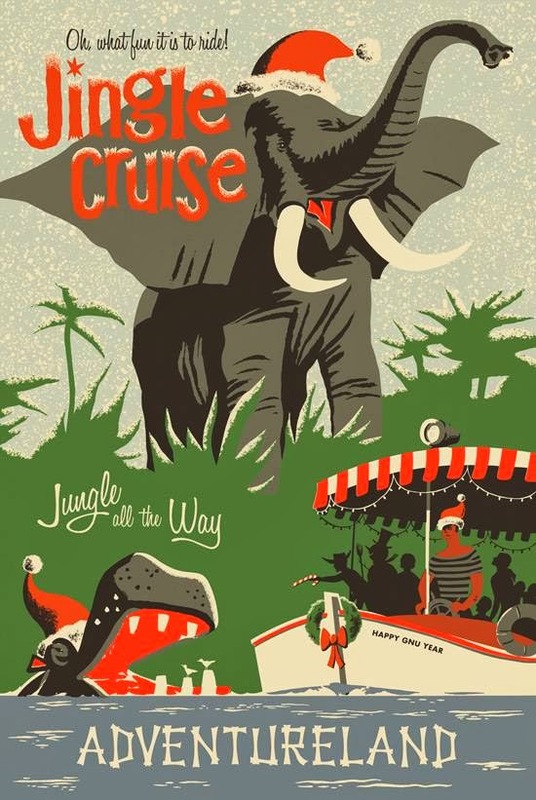 Also beginning Friday the 8th is the Christmas overlay for the Jungle Cruise - or now known as the Jingle Cruise. I love this poster for the ride - and am crossing my fingers that they might actually have prints for it! I cannot wait to see the decorations, renamed boats, and hear some holiday puns! Check out the Disney park blogs to see new limited edition pins commemorating the different gingerbread creations at the resorts. Also - there are dates set so that you can meet the pastry chefs behind the Gingerbread houses! If you are going to be at Disney for Christmas and have an appointment at the Bibbidi Bobbidi Boutique - you have new options! There are wigs from the new movie "Frozen" - along with costumes for Anna or Elsa. Also, there is a new holiday Minnie dress and headband! Premiering today - the trailer for Disney's Maleficent! Will this be part of your summer movie lineup? Did you know that Disney honors every single day in the Magic Kingdom? 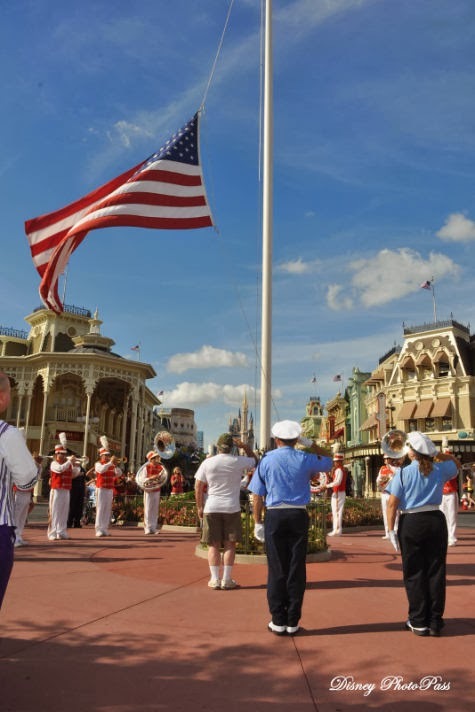 Each day at 5pm there is a flag retreat ceremony in the square on Main Street at the entrance to the park. This ceremony has happened every evening since the park first opened on October 1, 1971. Click here for a great article from a Vietnam Veteran about his experience in participating in the ceremony. Another way that Disney honors veterans is with their salute to America park tickets and military discounts. Please message me for more information on those exclusive discounts!